I believe that’s true, even without considering the specific problems of the Public Beta (although there are certainly enough of them). What’s worse, Apple is willfully walking down this path to self-destruction, ignoring both the lessons of its biggest competitor and its own experience in the early 90s. 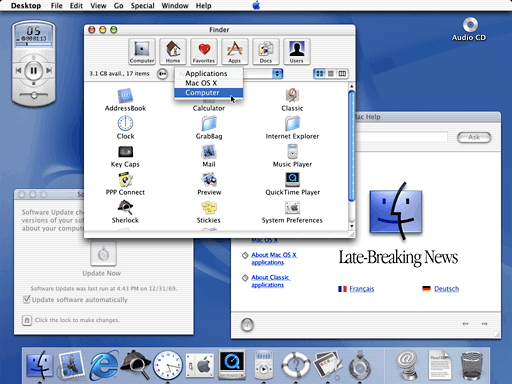 Although the Mac press portrays Apple’s decision to release OS X Public Beta as a breakthrough (and it is, for Apple), Microsoft did the same thing with Windows 95 in 1994 and early 1995. As I recall (and I was mostly a Windows/PC user at the time), the Win 95 beta period established two things: You could run Windows 95 reasonably well on midlevel hardware, and you didn’t need to do anything special to run your existing applications. First point: In 1995, the general state of the art in mass market PCs was a Pentium 90. A whole lot of power users were on 66 MHz 486s, and even more folks had 486-25s. They could all run Windows 95. Think about it: Mac users take pride in the long useful lives of Macs. We appreciate what a 6100 will still do, six years after it was released. And we know that a PC from that era is mostly dead weight. But back then, Microsoft accomplished something really smart: The company made Win 95 run on what most people owned. With one stroke, Microsoft kept millions of folks in the game. And when they could, those millions of folks went on to buy newer machines (and newer versions of Windows). Well, make that two strokes, because the other thing Microsoft did right was make Windows 95 seamlessly compatible with earlier Windows applications. You could run Win 3.x versions of software, and the experience was pretty much the same as it had been under the Windows 3.x. In fact, it was a little better: The 3.x apps gained some of Win 95’s interface features. True, there were lots of warnings about how the legacy apps could still crash the system, and how they couldn’t take advantage of Win 95’s faux “preemptive multitasking.” But they worked, and being able to use what you already had just made the eventual upgrade easier. Most important: You didn’t have to launch a special “environment” to run the 3.x apps. It was all Win 95. The closest parallel I have to OS X’s classic environment is the Win 3.x environment used by OS/2, IBM’s operating system of the early 90s. It was nuts: You could use all your old primitive Windows apps while waiting for advanced OS/2 applications to come to market. Now remember what Apple did when it made the switch to PowerPC. Through the heroic efforts of many programmers, Mac users were able to move the vast majority of their 68k applications over to Power Macs without a hitch. There was no “classic environment” to be launched; it was all Macintosh. You can fairly argue that I’m comparing (no pun intended) apples to oranges, because Win 95 had its roots in the earlier DOS/Windows world, while OS X is completely different from all earlier versions of the Mac OS. I agree. But think about it this way: How far would Microsoft have gotten in 1995 if it had introduced Windows NT 4 as its mainstream operating system and forced users to run a special 3.x environment in NT? I have never, ever heard of a Mac user switching platforms because Macs crash. In fact, I have never, ever heard of an ordinary person buying a computer based on the stability of the OS. Obviously, stability is a very big deal for servers. But it just doesn’t make that much difference at the desktop level. Most businesses I know continue to run Win 95 on the majority of their office machines, and no one has ever accused the Windows 9x family of being overly stable. It is beyond me why Apple could not have extended the 9.x OS, adding in more preemptive multitasking and other “modern” features. Much of the Mac press takes it as an article of faith that the existing OS could not sustain much more, but I have never seen this claim backed up. What I suspect is more the case here is that Steve Jobs felt he needed to make a clean break with the Apple he inherited. He has done so brilliantly on the style front. There was never any serious thought given to continuing the existing OS. Ultimately, I see little or no compelling reason why most people will want OS X, other than they may have to use it if they want to continue to run Macs. But not all people will have that choice: OS X automatically disenfranchises everyone with a pre-G3 Mac. Is this necessary? Well, OS X is Unix under the hood, and I can run Unix on my 6100, my 6400, and my StarMax 4000 in 32 MB of memory. I assume Aqua and Quartz and all add to both processor and memory requirements, but again I’m not inclined to give Apple the benefit of the doubt. I think Jobs wants to enforce the clean break. That’s fine if you think Apple wasn’t much between 1985 and 1997, but you are leaving out millions of loyal customers. By contrast, I have a catalog on my desk from another company that prides itself on style: Volkswagen. Same kind of customer, loyal to a fault, forgiving, fanatic. All the way through this catalog, you see pictures of older VWs side-by-side with New Beetles and ad copy that generally suggests a “big tent” in which all VW owners are part of the family. Just once, I’d like to see a picture of a 7600 on Apple’s web site, side by side with a G4. Of course, you have to value continuity to think like that. You have to believe the past is worth respecting and building on, that what you already have is worth extending, that you get further by increments than by revolutions. Apple is throwing away an interface that has been battle-tested, refined by the experience of a couple of generations of users, and worn smooth in the rough spots. Whatever you may think of the stability of the OS itself, the interface is the hardiest on the market. Apple should not sacrifice this in the name of elegance! I think Apple should prepare to move OS X to the server market, announce a plan to gradually incorporate underlying OS X elements into the mainstream OS, and start looking at the genuinely new interface conventions likely to arise from groups like Eazel or, most particularly, Apple’s own Jef Raskin. Steve Jobs has done a wonderful job of re-imagining the look of Apple’s hardware. He has also succeeded in throwing out parts of the Mac’s hardware without destroying the company. It’s the same deal with USB vs. ADB, and the addition of FireWire. In fact, in all cases it’s possible to upgrade any Mac built in the last five years to the current hardware standard. And it’s the same stuff PCs use, which helps. A lot. That is not where we are going with OS X. We are headed to a place, I fear, where the beauty of the OS blinds the faithful, where the Mac is cut adrift from its remaining ties to the rest of the computer world, and where the verdict of both believers and nonbelievers alike will ultimately be: dazzling, but why bother?